The Captain Marvel trailer has landed and it’s everything fans hoped it would be. Fast-paced, fierce and with a much longed for glimpse of a Blockbuster Video shop (RIP old friend). Finally, Brie Larson is here, as headstrong hero Carol Danvers; leaping on trains, flying spacecrafts and fixing the camera with a look of pure steel. 28-year-old Larson already appears perfect for the role; strong yet expressive, other-worldly yet vulnerable, and the breathtaking imagining of outer space is everything we’ve come to expect from the Marvel Cinematic Universe. In a scene where Carol boards the subway, an elderly woman makes eye contact with her and – instead of offering to carry her bags – Carol wollops her one across the face. Not exactly the sort of enemy you’d expect to see Captain Marvel focus her superhuman attentions on. Now, it’s probable this was an alien threat disguised as a human geriatric (one would hope), but the visual strangeness of the altercation has proven to be thoroughly rib-tickling for fans. The only thing I got from this trailer is that she is not afraid to knock an old ladies lights out. The scene has quickly become a meme, with fans using the footage to make jokes about everything from public transport and CVs, to the general ‘don’t give a heck’ attitude of Carol. "Discover What Makes Her A Hero" (Then shows Captain Marvel punching an old lady in the face.) I salute your editing choice, Marvel Studios, but you should have had them in the express lane as the lady buys fifty cans of cat food and rummages for a 10cent off coupon. I would love to see folks' reactions who don't know what the Skrulls whole deal is when Captain Marvel punches that old lady. However never fear. It appears there’s method in the madness and Carol actually had a really good reason for punching the kindly looking pensioner. Indeed, it’s widely believed by many well-informed nerds, this is actually a shape-shifting Skrull, who deserves to get every sort of hellish public transport experience imaginable. The Skrulls are a scientific, militaristic, and technologically advanced race of extraterrestrial reptilian humanoids that are capable of shapeshifting. In the comics, the Skrulls are a race of alien shapeshifters bent on invading Earth as an advantage in their prolonged war with the Kree. One of their major feats was to replace many of Earth’s heroes with Skrull operatives in what was called the Secret Invasion. Fans have been waiting to see Skrulls for some time. James Gunn wanted to include the Skrulls in Guardians of Galaxy, but this never came to pass. The Skrulls were also intended to be the main villains in an early draft for The Avengers, however the Chitauri’s less complex background was deemed more suitable in the end. What if the old lady that Captain Marvel punch wasn’t a Skrull. 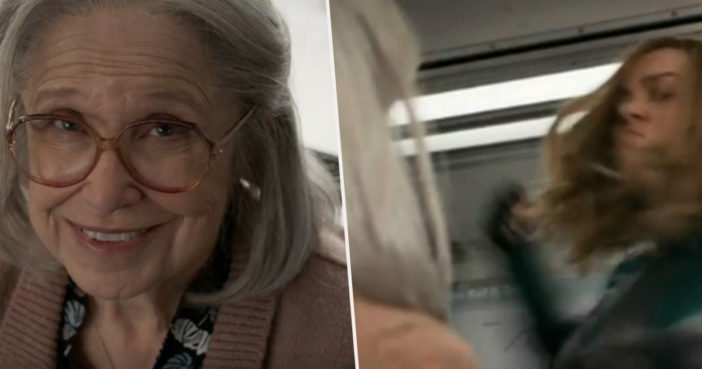 Seeing Captain Marvel punching an old lady on a bus during a sweeping montage about hope is definitely not something I expected to see when I woke up this morning.